The City of Commerce had joined a long list of communities affected by lead contamination from a Vernon-based battery recycling plant permanently closed in March for hazardous waste violations. The disturbing news was announced last week by the Department of Toxic Substances Control (DTSC), which said it used wind pattern modeling to add Commerce to the soil sampling target zone. Five to 10,000 properties could be contaminated with lead from the Exide Technologies plant, according to state toxic chemical regulators. Exide’s troubling history of toxic chemical air emissions and hazardous waste violations has sparked outrage and protests in an area that runs from Boyle Heights, East Los Angeles and several Vernon-adjacent Southeast cities. Commerce City Administrator Jorge Rifa told EGP said they are in the “very early stages” of understanding the “scope and extent” of the damage in Commerce, but said city staff and the city council will do everything within their jurisdiction to address the problem. Like Vernon, Commerce is also an industrial city, the biggest difference Commerce has over 13,000 residents compared to about 200 Vernon residents. News that toxic pollution from Exide had made its way to homes in Commerce caught many in the city by surprise. 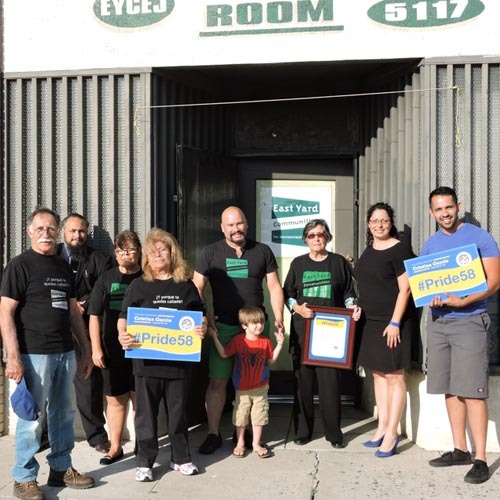 City Planner Jose Jimenez told EGP he attended a public meeting in Boyle Heights Aug. 13 and there was no discussion of possible lead contamination in Commerce. Mayor Pro Tem Tina Baca del Rio attended last week’s meeting and told EGP she was taken aback by the news. She said Vernon needs to revise its policies regarding the types of businesses is allows to operate in that city because they not only impact Vernon, but other communities as well. Del Rio said she is committed to working on the issue with representatives from all the affected areas. Last Friday, Assemblywoman Cristina Garcia, who represents Commerce, issued a statement demanding the immediate cleanup of contaminated properties and for DTSC to not spend more time on site testing. “This contamination is now more widespread and my first concern is with the immediate health of citizens in the City of Commerce, especially our most vulnerable, such as pregnant women and young children who may come in contact with contamination in their yards or at the playground,” Garcia said. “The continued testing is expensive and continues to only reaffirm what the scientific models show to be the likely spread of the contaminant,” she added. But according to DTSC spokesperson Sandy Nax, additional testing is needed to identify the locations of lead deposits and concentrations before cleanup can begin. “Testing also helps with prioritizing cleanup of properties with the highest contamination,” he told EGP. The northern part of the Union Pacific Railyard is believed to be most affected, Rifa said. The city council has schedule the issue for discussion at its Sept. 8 meeting. DTSC will brief the council on the results of their findings and answer questions, he said. In the meantime, Garcia’s office reported that DTSC is working on a letter/email that in the next few days will be sent to residents in the impacted area. “This letter/ email will just explain what is currently going on and what the next steps are,” states Garcia’s office. With the information being so fresh, city staff told EGP many residents and business owners may not yet be aware of the latest findings. “I haven’t heard from any business owner” as of yet, Deputy City Administrator Fernando Mendoza told EGP. Eddie Tafoya, executive director of the city’s Chamber of Commerce Industrial Council, told EGP Tuesday they had only just recently heard the news and are still getting caught up on the issue. While many in the city expressed surprise over the latest DTSC pronouncements, Commerce is not new to the controversy. In 2013, the city council sent a letter to Vernon requesting they close the plant, but according to Rifa, they never received a response. The issue could be tricky for Commerce, which also has a large industrial base and is home to one of the busiest railyards in the country, two known sources of pollution. Unlike Vernon, however, residents in the city have a strong history of pushing environmental concerns, such as pushing to stop trains from idling near homes and most recently a ban on idling by large trucks in order to decrease the harmful effects of diesel emissions to residents and workers in the city. Garcia said she is committed to work with Commerce, residents, the advisory board and DTSC to keep the public informed about “this hazard and the health screenings needed” to move the community forward. Due to privacy and confidentiality concerns, DTSC will not release information about private property owners and residents, including who is being tested or the results, stated Garcia. Rifa encouraged those who may be concerned to visit their doctor and to be tested for lead. Following other simple directions, such as removing shoes before entering a house, also makes sense, Rifa said. “The test will show whether the level is above the Centers for Disease Control’s acceptable limits, and whether medical attention is needed,” said Rifa. Los Angeles County Department of Public Health is still testing the blood-lead levels of residents near the Exide facility. Those interested can sign up for the testing at www.bloodleadtesting.com or by calling toll-free:1-844-888-2290. Fuming over news that as many as 10,000 homes could be contaminated with lead spewed from the now closed Exide Technologies plant in Vernon, hundreds of people on Thursday demanded state regulators immediately begin clean up of what could turn out to be the biggest “environmental clean up and public health disasters in California history. “If you can’t handle the problem get out of the way and let federal government step in,” insisted Terry Cano, a resident of Boyle Heights whose home was found to have higher than safe levels of lead but has not yet been decontaminated. “I don’t care where it came from, just clean it up,” she said angrily during a public meeting of the Department of Toxic Substances Control (DTSC) community advisory group in Huntington Park at the Salt Lake Park Community Center. DTSC revealed just over a week ago that the agency had expanded soil sampling for lead to a larger geographical area and the tests revealed much higher numbers of property contaminated with the toxic chemical than previously believed. 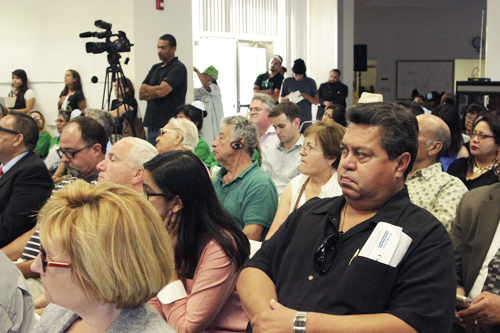 Angry residents living within the contamination zone — from Huntington Park, Bell, Boyle Heights, Commerce, East Los Angeles and other communities near the former lead-battery recycling and smelting plant packed — packed the advisory committee meeting and loudly demanded the state agency admit its failures and speed up the clean up. DTSC will use $7 million it received from the state Thursday to swiftly clean homes with lead levels above 1,000 parts per million, agency Director Barbara Lee told the loud crowd Thursday. 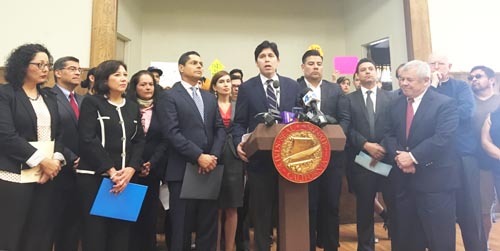 The state’s money will be added to the $9 million Exide was forced to place in a community trust fund as part of an agreement to avoid federal criminal prosecution for its illegal handling of hazardous waste. Lee said half of the funds would be used to conduct additional testing in the expanded zone, which will now include Commerce as well as Boyle Heights, Maywood and Huntington Park. The comments struck a nerve with Assemblywoman Cristina Garcia who represents Commerce. Several members of the community advisory committee, which is supposed to be providing input and oversight for the clean up process, also expressed distrust in DTSC’s ability to handle the cleanup. It’s time for California to declare a state of emergency and for FEMA (Federal Emergency Management Agency) to step in and coordinate a mass evacuation from homes, some speakers said. The $9 million Exide set aside was to pay for the cleanup of 219 homes north and south of the plant. So far, lead-tainted soil has been removed from 146 homes. An additional 146 homes were tested in an area beyond the initial scoping area to determine the extent of Exide’s contamination. Media reports have placed the cost between $150 million to $200 million. According to Lee, DTSC is working to secure funds for the expanded residential cleanup. DTSC Chief of Permitting Rizgar Ghazi explained the cost to clean up the Exide plant site would cost the company $26 million.